Reading and share top 151 famous quotes and sayings about My Beloved by famous authors and people. Browse top 151 famous quotes and sayings about My Beloved by most favorite authors. 1. "I read Greek myths. I read about far off places, Venice and Paris. I read about men who searched for things they could not find at home, and women who fell in love with the wrong person and waited for the arrival of their beloved for so long that a year was no different from a single day. The same thing was happening to me. Years were passing. I was already a woman, and I still wasn't done reading." 2. "If every life is a river, then it's little wonder that we do not even notice the changes that occur until we are far out in the darkest sea. One day you look around and nothing is familiar, not even your own face. My name once meant daughter, grandaughter, friend, sister, beloved. Now those words mean only what their letters spell out; Star in the night sky. Truth in the darkness.I have crossed over to a place where I never thought I'd be. I am someone I would have never imagined. A secret. A dream. I am this, body and soul. Burn me. Drown me. Tell me lies. I will still be who I am." 3. "I am my beloved's, and my beloved is mine. (Song of Solomon 6:3a)"
4. "You, Bedouin of Libya who saved our lives, though you will dwell forever in my memory yet I shall never be able to recapture your features. You are Humanity and your face comes into my mind simply as man incarnate. You, our beloved fellowman, did not know who we might be, and yet you recognized us without fail. And I, in my turn, shall recognize you in the faces of all mankind. You came towards me in an aureole of charity and magnanimity bearing the gift of water. All my friends and all my enemies marched towards me in your person. It did not seem to me that you were rescuing me: rather did it seem that you were forgiving me. And I felt I had no enemy left in all the world." 5. "Silent solitude makes true speech possible and personal. If I am not in touch with my own belovedness, then I cannot touch the sacredness of others. If I am estranged from myself, I am likewise a stranger to others." 6. "My child, if you want to have a beautiful and happy life... 2 things you need... learn the art of love and practice it with your beloved one." 7. "When I said that this lady was known to me, I meant that I esteem her more than anyone else on this earth. If I can do my duty and walk away from my best beloved, you can all do yours and listen to what she has to say." 8. "Amor, ch'al cor gentile ratto s'apprendeprese costui de la bella personache mi fu tolta; e 'l modo ancor m'offende.Amor, che a nullo amato amar perdona,Mi prese del costui piacer sì forte,Che, come vedi, ancor non m'abbandona...""Love, which quickly arrests the gentle heart,Seized him with my beautiful formThat was taken from me, in a manner which still grieves me.Love, which pardons no beloved from loving,took me so strongly with delight in himThat, as you see, it still abandons me not..."
9. "There is point in your life when you come face to face with the reality that you cannot take another step on your own. For me, I had never experienced that point, but depression brought me there. I have slowly, painfully and continually been confronted by my brokenness. Coming to terms with the fact that I am broken has been at the center of my accepting my being loved.For me, now, there exists a sense of desperate need for what God brings to my spiritual and mental self. Without His voice I cannot cope with the darkness, but with His whisper of "you are My beloved", I can take a step each day away from the chasm. I am broken but not beyond mending, not beyond love. It has been this desperation that has opened a crevice in which I am seeing Him for the first time. He is why my soul can find some peace even when my mind is dark and numb. It is this love that continually has brought me back from the edge of the impostor to the honesty of my broken, inner self"
10. "The hunt isn't sustaining me. It's flowing blood that I really crave. The sweet taste of red succulent liquid mixing with the salt of my beloved as it drips and dances on his flesh. To know that someone will ache for me as much as I hunger for him and eternally satiate each other. I want someone to satisfy my hunger forever." 11. "I searched for my Beloved in the strangest of places, until the day I realized I couldn't take my eyes off Her." 12. "Lie beside me, oh my beloved! For thy thorns are more pleasurable than the petals of the world.Hold me in thy arms of hope, for the truth of separation can rest tonight." 13. "White Man, let us stand together to secure the survival of your people and my people, for they are one and the same - they are our beloved, miraculous, wonderful, blessed and masterful white race!" 14. "I recognized the handwriting, and my heart gave a skip; when I opened it I got a turn, for it began, 'To my beloved Hector,' and I thought, by God she's cheating on me, and has sent me the wrong letter by mistake. But in the second line was a reference to Achilles, and another to Ajax, so I understood she was just addressing me in terms which she accounted fitting for a martial paladin; she knew no better. It was a common custom at that time, in the more romantic females, to see their soldier husbands and sweethearts as Greek heroes, instead of the whore-mongering, drunken clowns most of them were. However, the Greek heroes were probably no better, so it was not far off the mark." 15. "Foes and false friends are all around me, Lord Davos. They infest my city like roaches, and at night I feel them crawling over me." The fat man's fingers coiled into a fist, and all his chins trembled. "My son Wendel came to the Twins a guest. He ate Lord Walder's bread and salt, and hung his sword upon the wall to feast with his friends. And they murdered him. Murdered, I say, and may the Freys choke upon their fables. I drink with Jared, jape with Symond, promise Rhaegar the hand of my own beloved granddaughter…but never think that means I have forgotten. The north remembers, Lord Davos. The north remembers, and the mummer's farce is almost done. My son is home." 16. 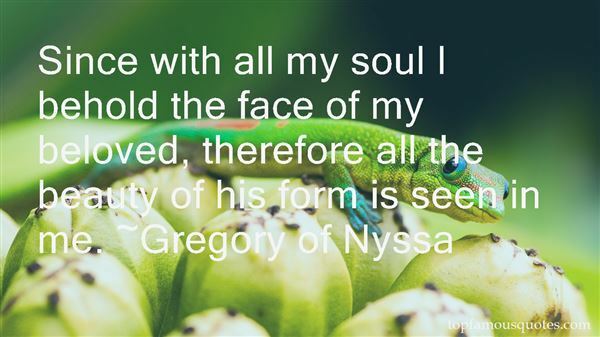 "Since with all my soul I behold the face of my beloved, therefore all the beauty of his form is seen in me." 17. "I kept running around it in large or small circles, always looking for someone or something able to convince me of my Belovedness.Self-rejection is the greatest enemy of the spiritual life because it contradicts the sacred voice that calls us the "Beloved". Being the Beloved expresses the core truth of our existence." 18. "Tacked above my desk are photos of artists I admire - Hopper, Sargent, Twain - and postcards from beloved bookstores where I've spent all my time and money - Tattered Cover, Elliot Bay, Harvard Bookstore." 19. "What can I say to you that I haven't already said? What can I give you that I haven't already given? Is there anything of me that isn't yours already? My body, my mind, my heart, even my soul. Everything that is me belonged to you long before this, and it shall be yours long after this. I will follow you anywhere and everywhere you lead. I will keep you and anyone created with our love safe from all harm. From this day on, I choose you, my beloved, to be my wife. To live with you and laugh with you; to stand by your side, and sleep in your arms; to bring out the best in you always, and, for you, to be the most that I can. I promise to laugh with you in good times, to struggle with you in bad; to wipe your tears with my hands; to comfort you with my words; to mirror you with my soul; and savor every moment, happy or sad, until the end of our lives and beyond." 20. "The pause was to Elizabeth's feelings dreadful. At length, with a voice of forced calmness, he said: "And this is all the reply which I am to have the honour of expecting! I might, perhaps, wish to be informed why, with so little endeavour at civility, I am thus rejected. But it is of small importance. ""I might as well inquire," replied she, "why with so evident a desire of offending and insulting me, you chose to tell me that you liked me against your will, against your reason, and even against your character? Was not this some excuse for incivility, if I was uncivil? But I have other provocations. You know I have. Had not my feelings decided against you— had they been indifferent, or had they even been favourable, do you think that any consideration would tempt me to accept the man who has been the means of ruining, perhaps for ever, the happiness of a most beloved sister?" 21. "For once, I agree with Blake." Daemon met my shocked stare. "We can't, Kitten. Not now. "I wasn't okay with this, but I couldn't run down the hall, letting people free. We didn't plan for that and we only had a set amount of time. It sucked-sucked worse than people who pirated books, sucked more than a year for the next book in a beloved series, and sucked more than a brutal cliffhanger ending." 22. "As for you, my beloved friend, I loyally believe in your uniqueness; but whenever I try to tell to you wherein it consists, I helplessly describe only a type." 23. "I release you, my beautiful and terrible fear. I release you. You were my beloved and hate twin, but now, I don't know you as myself"
24. "I don't feel like my job is to be beloved." 25. "That same night, I wrote my first short story. It took me thirty minutes. It was a dark little tale about a man who found a magic cup and learned that if he wept into the cup, his tears turned into pearls. But even though he had always been poor, he was a happy man and rarely shed a tear. So he found ways to make himself sad so that his tears could make him rich. As the pearls piled up, so did his greed grow. The story ended with the man sitting on a mountain of pearls, knife in hand, weeping helplessly into the cup with his beloved wife's slain body in his arms." 26. "I am back in my beloved city. The scene of desolation fills my eyes with tears. At every step my distress and agitation increases. I cannot recognize houses or landmarks I once knew well. Of the former inhabitants, there is no trace. Everywhere there is a terrible emptiness. All at once I find myself in the quarter where I once resided. I recall the life I used to live: meeting friends in the evening, reciting poetry, making love, spending sleepless nights pining for beautiful women and writing verses on their long tresses which held me captive. That was life! What is there left of it? Nothing." 27. "My beloved has arrived, but rather than greeting him, All I can do is bite the corner of my apron with a blank expression- What an awkward woman am I. My heart has longed for him as hugely and openly as a full moonBut instead I narrow my eyes, and my glance to him Is sharp and narrow as the crescent moon. But then, I'm not the only one who behaves this way. My mother and my mother's mother were as silly and stumbling as I am when they were girls...Still, the love from my heart is overflowing, As bright and crimson as the heated metal in a blacksmith's forge." 28. 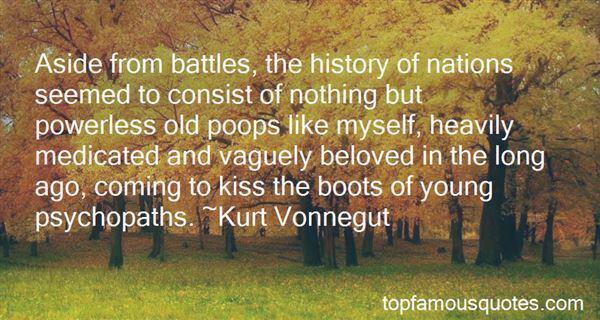 "Aside from battles, the history of nations seemed to consist of nothing but powerless old poops like myself, heavily medicated and vaguely beloved in the long ago, coming to kiss the boots of young psychopaths." 29. "...it's not all it's cracked up to be, having real emotions. I know that with the most dazzling men there have been times I've been terribly bored and I am sure they've been equally bored with me. Then much of life is indeed boring, and that's nobody's fault....Myself, I've been in the very arms of a beloved and felt nothing, when the only choice was whether to admit I felt nothing or to lie. The hardest thing about loving someone is those moments when you're not. And there are inevitablty such moments; the amount of trust required to get past them is stupendous." 30. "Do not write. 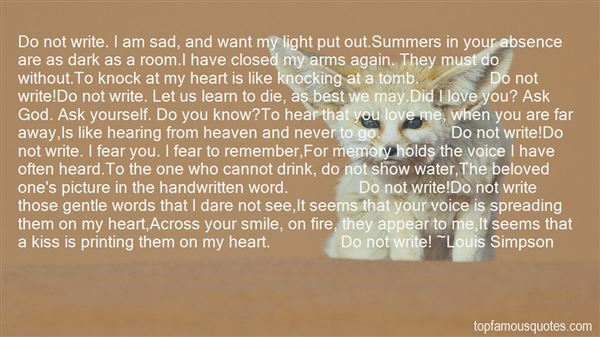 I am sad, and want my light put out.Summers in your absence are as dark as a room.I have closed my arms again. They must do without.To knock at my heart is like knocking at a tomb. Do not write!Do not write. Let us learn to die, as best we may.Did I love you? Ask God. Ask yourself. Do you know?To hear that you love me, when you are far away,Is like hearing from heaven and never to go. Do not write!Do not write. I fear you. I fear to remember,For memory holds the voice I have often heard.To the one who cannot drink, do not show water,The beloved one's picture in the handwritten word. Do not write!Do not write those gentle words that I dare not see,It seems that your voice is spreading them on my heart,Across your smile, on fire, they appear to me,It seems that a kiss is printing them on my heart. Do not write!" 31. "Come to me said the world. I was standingin my wool coat at a kind of bright portal—I can finally saylong ago; it gives me considerable pleasure. Beautythe healer, the teacher—death cannot harm memore than you have harmed me,my beloved life." 32. "I cannot regret it. They tell us in the temple that true joy is found only in freedom from the Wheel that is death and rebirth, that we must come to despise earthly joy and suffering, and long only for the peace of the presence of the eternal. Yet I love this life on Earth, Morgan, and I love you with a love that is stronger than death, and if sin is the price of binding us together, life after life across the ages, then I will sin joyfully and without regret, so that it brings me back to you, my beloved!" 33. "A magic lamp now seemed to be suspended in Maria's prison, and fairy landscapes flitted round the gloomy walls, late so blank. Rushing from the depth of despair, on the seraph wing of hope, she found herself happy.— She was beloved, and every emotion was rapturous." 34. "I am also praying for you, my beloved partner. God has a miracle breakthrough for your life." 35. "It is my aim, my destination in life to make the cello as beloved an instrument as the violin and piano." 36. "What first truly stirred my soul was not fear or pain, nor was it pleasure or games; it was the yearning for freedom. I had to gain freedom - but from what, from whom? Little by little, in the course of time, I mounted freedom's rough unaccommodating ascent. To gain freedom first of all from the Turk, that was the initial step; after that, later, this new struggle began: to gain freedom from the inner Turk - from ignorance, malice and envy, from fear and laziness, from dazzling false ideas; and finally from idols, all of them, even the most revered and beloved." 37. "Touch my song with your lips, make it immortal,be my beloved, make my love immortal.No restriction of age, not the bond of lives,when someone love should see only the soul,by carving new trend, make the trend immortal.Loneliness of the sky is in my lone heart,with rattleing paayal enter into my life,by giving own breaths make the music immortalmake the music immortal, make my song immortal.World snatched from me, whatever was beloved to me,all won from me, I lost at every moment,by losing your heart you make my victory immortal.written By "Honthon Se Chhoo Lo Tum - Jagjit Singh"
38. "Dawn filled the sky with roses. In thecrystal-clear air the last song of the nightingaledies. The smell of the wine weakens. This is the momentwhen fools dream of fame! How softis your hair, my beloved!" 39. "LXXIXWhen I die, I want your hands on my eyes.I want the light and wheat of your beloved hands to pass their freshness over me once moreLI want to feel the softness that changed my destiny.I want you to live while I wait for you, asleep.I want your ears still to hear the wind, I want you to sniff the sea's aroma that we loved together,to continue to walk on the sand we walk on.I want what I love to continue to live,and you whom I love and sang above everything else.to continue to flourish, full-flowered.So that you can reach everything my love directs you to. So that my shadow can travel along in your hair,so that everything can learn the reason for my song." 40. "Who am I to you?' That's what she asked me. 'Who am I to you?' I told her ‘You are my friend, my mate, my beloved; you are all the things I need and all the things I don't deserve. That's who you are, Sally. You are mine.'" ~Costin"
41. "You who never arrived in my arms, Beloved, who were lost from the start, I don't even know what songs would please you. I have given up trying to recognize you in the surging wave of the next moment. All the immense images in me -- the far-off, deeply-felt landscape, cities, towers, and bridges, and un-suspected turns in the path, and those powerful lands that were once pulsing with the life of the gods-- all rise within me to mean you, who forever elude me. You, Beloved, who are all the gardens I have ever gazed at, longing. An open window in a country house-- , and you almost stepped out, pensive, to meet me. Streets that I chanced upon,-- you had just walked down them and vanished. And sometimes, in a shop, the mirrors were still dizzy with your presence and, startled, gave back my too-sudden image. Who knows? Perhaps the same bird echoed through both of us yesterday, separate, in the evening..."
42. "Getting shot hurts. Still my fear was growing because no matter how hard I tried to breath it seemed I was getting less & less air. I focused on that tiled ceiling and prayed. But I realized I couldn't ask for Gods help while at the same time I felt hatred for the mixed up young man who had shot me. Isn't that the meaning of the lost sheep? We are all Gods children & therefore equally beloved by him. I began to pray for his soul and that he would find his way back to the fold." 43. "I am not from east or westnot up from the groundor out of the oceanmy place is placelessa trace of the tracelessI belong to the beloved"
44. "I am feeling a deep sense of immense and immeasurable love within my heart for all things divine. This love is so much bigger and greater than I am. It is all encompassing and all unconditional. As I bask in this love, my heart, and love goes out to each and everyone, and to all of God's creation. I humbly pray that we all can feel this love, and, can share this love, and apply this kind of love to our daily lives. I knee in gratitude, and with full purpose and sincerity of heart, to my most Beloved Father in heaven and His beloved Son, Jesus Christ as I submit all of me – all that I AM – and all that I will ever be, to have Divine Love to be present each and every minute, of every day for the rest of my life. I AM ALL THAT I AM because I AM DIVINE LOVE! My Heavenly Father, Please let me always be, Divine Love in action! Let each and every one of us, be Divine Love in Action." 45. "I will turn human anatomy into roses and stars and sea. I will dissect the beloveds body in metaphor." 46. "Break my mirror-heart into a thousand pieces my beloved, so that to the world i may proudly flaunt your thousand reflections"
47. "When I am an old man and I can remember nothing else, I will remember this moment. The first time my eyes beheld an angel in the flesh. "I will remember your body and your eyes, your beautiful face and breasts, your curves and this." He traced his hand around her navel before dragging it lightly to the top of her lower curls. "I will remember your scent and your touch and how it felt to love you. But most of all, I will remember how it felt to gaze at true beauty, both inside and out. For you are fair, my beloved, in soul and in body, generous of spirit and generous of heart. And I will never see anything this side of heaven more beautiful tham you"
48. "And so, my beloved Kermit, my dear little Hussein, at the moment America changed forever, your father was wandering an ICBM-denuded watseland, nervously monitoring his radiation level, armed only with a baseball bat, a 10mm pistol, and six rounds of ammunition, in search of a vicious gang of mohawked marauders who were 100 percent bad news and totally had to be dealth with. Trust Daddy on this one." 49. "I will call them my people, which were not my people; and her beloved, which was not beloved." 50. "Where is truth, forsooth, and who knoweth it? Is Beauty beautiful, or is it only our eyes that make it so? Does Venus squint? Has she got a splay-foot, red hair, and a crooked back? Anoint my eyes, good Fairy Puck, so that I may ever consider the Beloved Object a paragon! Above all, keep on anointing my mistress's dainty peepers with the very strongest ointment, so that my noddle may ever appear lovely to her, and that she may continue to crown my honest ears with fresh roses!" Laughter can be a form of forgiveness—a gift, cathartic."